I was talking with a client this week, she was concerned. One of the departments she works closely with was in conflict with her department and she was caught in the middle. There were breakdowns in communication, misunderstandings, and missed deadlines. She asked me what she should do. I told her to be the needle. Then I told her this story. There was once, long ago, two kingdoms. They had been battling for many years and there was much loss of life, sorrow and pain on both sides. As was done in those days, there was to be a royal marriage to unite these two kingdoms. Gifts were customary on these occasions. The king of one realm sent a pair of beautiful golden, jeweled scissors to the queen of the other realm as a wedding gift. The queen remarked of their exquisite beauty but asked for them to be returned. The queen requested to be given a needle instead, that this would be an even more treasured gift. The king was intrigued and requested to know why. The queen replied, scissors, even as beautiful as those given, can only cut, divide, and separate. Both kingdoms had already endured this far too much. 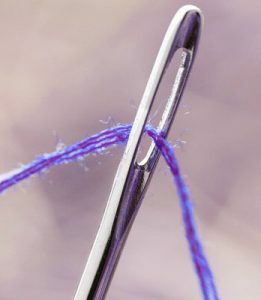 A needle on the other hand mends and brings together that which is separate. This is what she desired the most. The king agreed and as time went on their kingdoms flourished. They lived happily ever after. My client then asked me a compelling question. How? Being the needle starts as a mindset. Stepping back, being the witness, without judgement. Don’t judge anything, be curious. Can you see each person’s point of view? Do you know what they are feeling and thinking? If the answer is no, then find out. The next step is to find out where there is agreement, things in common, what is going well. Acknowledge each side for their contribution, provide recognition and appreciation. Very few people today feel they receive enough appreciation for their efforts. What is focused on, grows. Next, is the detective work. Uncover what is truly desired for the situation. What does each side really need? Often what is stated, is only surface level. For example, if Department A would just provide those reports on time, everything would be fine. Digging deeper uncovers Department A needed to understand the patterns that the reports could reveal, so receiving the reports consistently was critical. Department B felt creating the reports were overly complex and a waste of time. As it turned out only about half the data tracked were actually used from the reports. Being the needle facilitates the coming together of both sides to discuss each other’s needs with respect, empathy and appreciation. Being the needle brings down the walls that we build up over time between ourselves and others. It builds bridges of communication, demonstrates caring and empathy, encourages and acknowledges efforts, and addresses the often ignored feelings of those involved. So, how can you be the needle today?